We are close to you!! 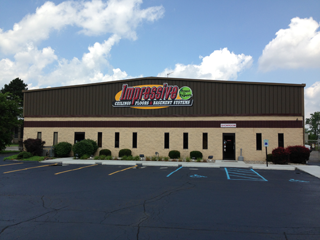 On 8 Mile between Myers and Coolidge we are only 20 minutes from Rochester, Plymouth, Grosse Pointe, West Bloomfield, Allen Park, and St. Clair Shores. Visit Our Facebook Page For More Man Cave Ideas! Wall panels are removable for easy access. Strong durable panels that won’t mold or rot. Fast clean installation, complete in 2 weeks with no drywall dust. 85% noise reduction – perfect for home theater and office. Hang what you want on our walls with no hassles. No phenol, formaldehyde, acrylics, or artificial colors. 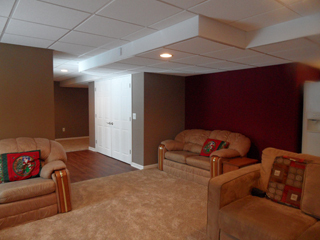 Our basement finishing system is healthy, green, and made from recycled materials. A system that literally breathes! Removable wall panels for easy access to your foundation. 85% noise reduction, perfect for home theater. Fast clean installation in about 2 weeks. Mold and mildew resistant, and made specifically for basement living conditions. I would like to thank Impressive Tile for the great job they did on our basement. Your workers were very professional and I was amazed at how clean and fast they were. I now have the best basement on our block! I would like to congratulate Impressive Basements for a job well done. My wife gives line dancing lessons and the vinyl plank floor you put in is working out perfect. The sound quality of your system is remarkable, everyone who comes downstairs comments on it.